Fig. 205 Leaf . (a) Simple leaves. (b) Compound leaves. the principal photosynthetic organ of vascular plants, which typically consists of a flattened lamina joined to the stem by a stalk or petiole, at which junction an axillary bud can be found. 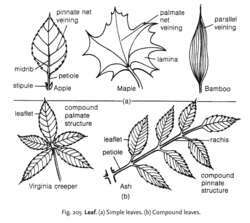 There are numerous types of leaves. dorsiventral leaves are held horizontally with the upper half of the lamina containing the majority of photosynthetic cells (see MESOPHYLL for diagram). Typically, the lower epidermis contains the majority of STOMATA through which gas exchange and transpiration take place. Leaf veins are usually arranged in a ‘net’ venation with principal veins called midribs. The lamina can be indented to form a ‘compound’ leaf or remain as a simple structure. See Fig. 205 . Dorsiventral leaves are typical of DICOTYLEDONS. isobilateral leaves grow erectly, with a sword-like shape and are typical of MONOCOTYLEDONS. Both epidermal surfaces contain stomata with palisade mesophyll tissue packed underneath. Isobilateral leaves have a parallel venation and are not divided into compound structures. See also KRANZ ANATOMY. centric leaves are more or less cylindrical with a central region containing the vascular bundles surrounded by mesophyll tissue. Examples are the needles of pine trees, and onion leaves. Some leaves have special modifications. For example, water storage leaves are found in many plants living in dry conditions (e.g. cacti). In other plants the leaves are modified into tendrils for climbing (e.g. pea) while in some the leaves have become spines, e.g. gorse. terminal outgrowths of plant foliage, usually flat green blades that conduct the plants' photosynthesis. Of the foliage it is much the most nutritious part and is often incorporated into special feeds, e.g. lucerne leaf meal. impaction of the cecum and colon in horses with access to indigestible tree leaves. Q. What happens if you leave appendicitis alone? I have symptoms of appendicitis, but I don't want to go to the hospital. What should I do? and what could happen? A. If you have symptoms of appendicitis you should see a doctor immediately, because the major complication of an untreated appendix is rupture and infection of the entire abdomen, that can lead to generalized sepsis. Q. Any ideas about why she leaves some food in her plate. Thank you for your visit. My daughter is 8 years old and she is a poor eater. She never wants to eat dinner even if it's her favorite dish. And then she picks it and an hour later she says that she feels hungry. She never completes her plate, always leaving a bit, no matter what we feed her. Should she be forced to eat dinner and if she doesn't, have only the dinner to eat later? Any ideas about why she leaves some food in her plate? A. She trusts her mom. The most common reason to be like this is she knows that she will get something to eat later from her dear mom. While she shouldn't be forced to eat, she should learn that her main meal in the evening will be served at the dinner time. •	Make sure that she isn't eating a big snack after school or filling up on juice, soda, or even milk before dinner. •	Offer her smaller portions so that there isn't as much left over on her plate. •	Don’t offer bribes or rewards for eating. •	Never talk about dieting, calories, and such, especially if she or other family members have problems with being overweight. Instead, talk about eating healthy. •	Consider not offering her anything else to eat if she misses dinner or just offer a small, healthy snack. Mainly a visit to your Pediatrician to monitor her growth, development and eating habits would also be a good idea. Hug her now! Q. What makes me worried that it’s really painful but might not be able to leave all of a sudden. Doctor diagnosed my son with peanut allergy after some tests. His body generates rashes and these eruptions are painful for him. I thought it big to be eczema as I heard about it, but now it is diagnosed and I am not able to decide how to avoid him of not giving peanuts and to keep him away as he likes them. Once near to me I can try to avoid to some extent, but once away to school or in playing with friends he does eat them regularly. What makes me worried that it’s really painful but might not be able to leave all of a sudden. A. My friend’s brother does have the experience of peanut allergy. These peanuts are nutritious, but its allergy is awful. He has a clear understanding of this and avoids eating them. I too have found that he followed strict guidelines for not eating them when it was diagnosed for him. The best thing is to create some other or new foodstuff taste for him which might help him be consumed an alternative for nuts for some times and then provide with peanuts for him to regain his remembrances for the culprit he consumes. It needs to be done under your care for long time till he develops the inhibitions for nuts. You must also remember to memorize some medicine names and symptoms, so, if consumed unknowingly can explain what it is to anyone responsible nearby. Charcoal Leaf sheets, with their lacy white maple leaves inspired by 1930s woodcuts, are paired with muted glen plaid bedding; and a fern-print cotton canvas bed-top teams with twill striped sheets in shades of red, khaki and cream. Making leaf prints can lead to learning about various trees simple versus compound leaves, alternate versus opposite branching, different sizes and shapes of leaves on one tree, or color variation in leaves. Curly leaf spinach, also known as Savoy or semi-Savoy spinach, is grown in the East, Midwest, South, and Mountain States regions of the United States, and is placed in highly sophisticated, ice-packed, sanitized containers when it is harvested. As this happens, the connection between the base of the leaf stem and twigs, or small branches, of the tree begins to weaken until it can no longer hold the leaf, and the leaf falls to the earth. It's quite clear this isn't the Arizona desert and we aren't talking about picking up one leaf. On young trees, however, there is more of a concern, especially since leaf miners do damage exclusively to young, expanding leaves in new flushes of growth. The northern catalpa can get leaf spot or powdery mildew, but these conditions are treatable. Indeed shorter term experiments have found increased leaf growth following auxin treatment. When an insect brushes against the inside of the plant's clam-shaped leaf, the active trap snaps shut. But few of us have the patience--or time--to wipe each leaf of a Ficus benjamina or similar plant with dozens of small, smooth leaves.